Started with 15 feral cats. Patty the care giver adopted all. With the cooperation of a local vet who gave a discount they all were spayed or neutered. It is natural that cats would disappear in a rural area next to a highway. Patty built a cat house with electric heating blanket. Let’s just say Marley was the last and only one who came to be a house cat only to be injured probably by a car. To me Marley was special as she would watch me through the window as I watch TV. Anyway, Marley being in pain was put down. 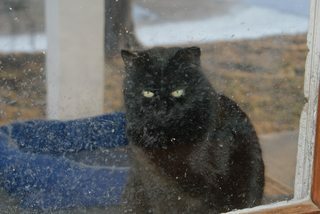 We feel sad not just for the cat, but after enduring harsh Kansas weather didn’t get much benefit of being an indoor cat. Aww, that's sad. Beautiful girl. Hugs. Sorry to hear this. Whether we wish it or not, pets become so important. You and Patty did give her and many others a much better life.